Because hull design is now so sophisticated, the term ‘semi- displacement’ is quite difficult to define, but broadly refers to moderately fast boats that have a fine bow entry, quite rounded bilges and some flatness aft to create lift. Traditional semi- displacement hulls are generally narrower than planing hulls and tend to operate at speeds from about 10-20 knots. Their more rounded sections help improve performance and sea-going comfort at slower as well as fast speeds. 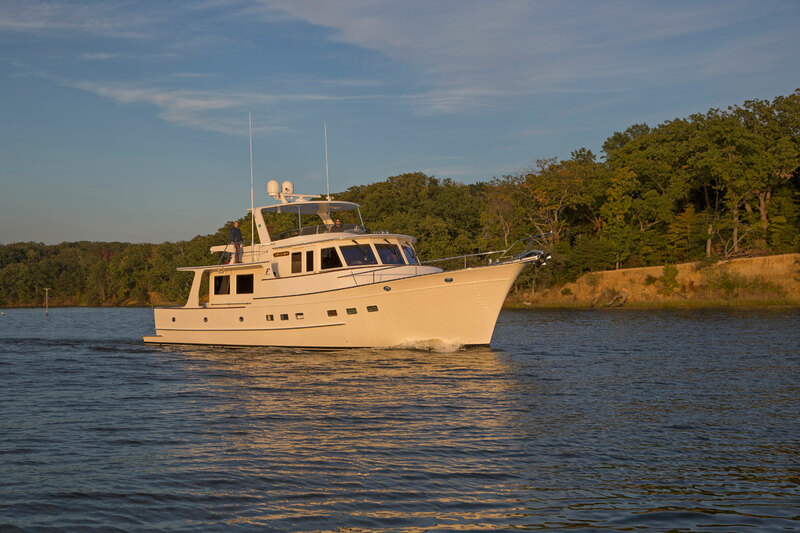 Although many Grand Banks and larger motor yachts like Flemings are notionally semi-displacement designs, in practice they tend to be cruised at economical displacement speeds, certainly on longer passages. They have the essential feel of displacement boats and soak up fuel at faster speeds. To my mind, semi-displacement cruising is almost an aesthetic rather than a technical category, usually associated with boats that have a rugged, working, professional kind of style. Well-known examples that stay popular as used boats are Aquastars, the older Nelsons and more recent Dale Nelsons, early Humbers, particularly the Humber 35, and the stylish Nelson-like Hagg designs such as the 36. 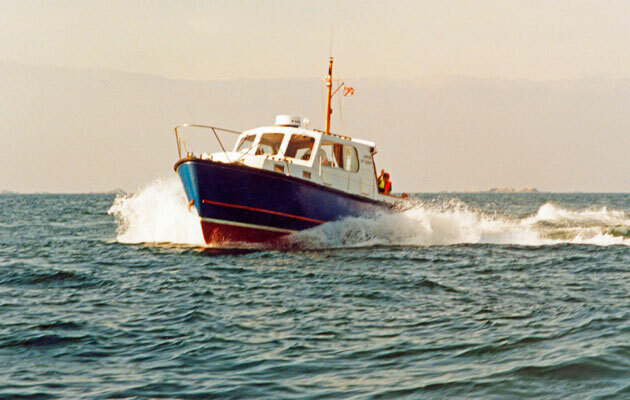 There are also smaller boats like the Corvette 32 and later 34, and the sturdy Buchanan-designed Channel Islands 22 and 32. Boating friends of ours, Bob and Jackie Stevenson (pictured below), are semi- displacement enthusiasts and keep their Aquastar 38 Arabesque on the Itchen at Southampton. Most summers they manage to escape for two or three months’ cruising. Bob had a sailing yacht for many years, cruising widely in the Channel, North Sea and Baltic. Then he and Jackie began exploring the European waterways with a comfortable Dutch barge, which they wintered in sunny Provence. Now their Aquastar 38 is ideal for home waters, easy for two to manage and a tough sea boat when the weather blows up. It’s interesting that many experienced sailing folk who switch to power opt for semi-displacement hulls with a working-boat style. Arabesque’s two Cummins 250hp diesels give an economical 16/17 knots at 2,000 revs, and a maximum 22 knots. Arabesque is meticulously maintained and equipped for longish spells away from base, with a good stock of spares neatly stowed. 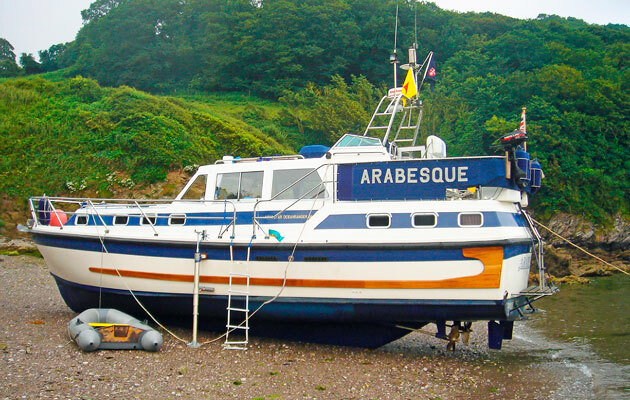 Interestingly, she carries legs for exploring shallow sandy inlets and drying lagoons around the Channel Islands, Brittany and Isles of Scilly – an Arabesque favourite. The long straight keel protects the props and shafts provided she dries out more or less upright. Bob and Jackie definitely prefer anchorages to marinas and the legs open up a wealth of secluded hideaways other boats can’t reach. Cruising golden rules: “Take your time! Don’t try to cram too much distance into your holiday. 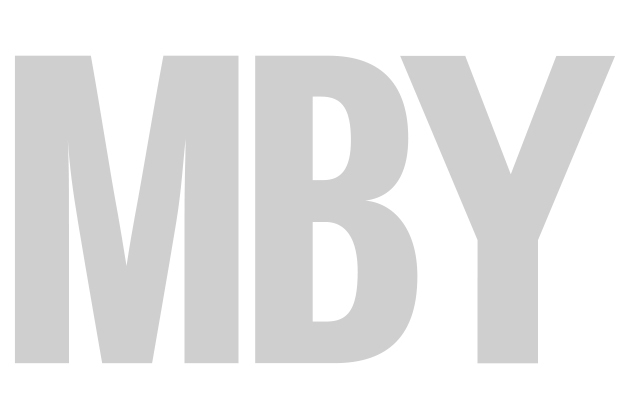 Jerseyman Mick Mollet has been boating since he was knee high and is a loyal MBY reader. 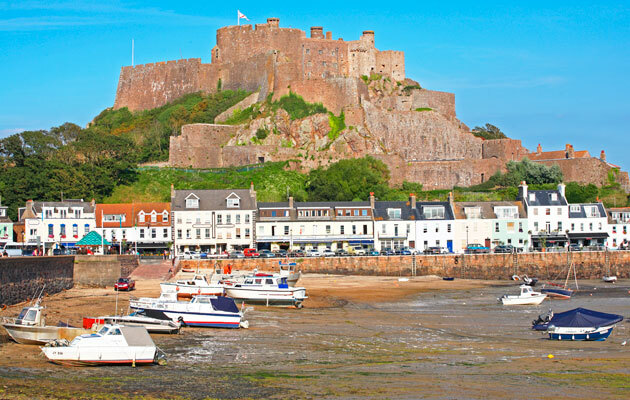 He and his wife Vi live near Gorey Harbour on Jersey’s east coast (pictured below). Graced by a spectacular castle, Gorey dries at half- tide and has a nostalgic salty atmosphere of boating before marinas were invented. Mick and Vi keep their Channel Islands 32 Heron of Gorey here and she sits snugly on legs when the ebb runs away. The legs easily swing up to stow horizontally. Heron was built in 1981 and the Molletts have owned her since 1992. Before Mick retired, he and Vi whizzed over to France virtually every summer weekend. Carteret was their favourite, an attractive marina next to peaceful marshes at the head of a sandy estuary. At neaps, Mick could get away around midday on Fridays, taking a short hour to Carteret in most conditions. At springs they’d leave Gorey in the early evenings as soon as Heron floated. 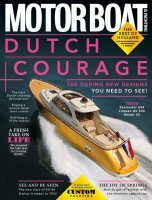 Two 270hp turbo Mermaids give an easy 16 knots at 2,200 revs. The Mollets enjoy the Écréhou archipelago for lazy days at anchor in the low tide lagoon. Some weekends in settled weather they’d head south to Îles Chausey and St Malo. 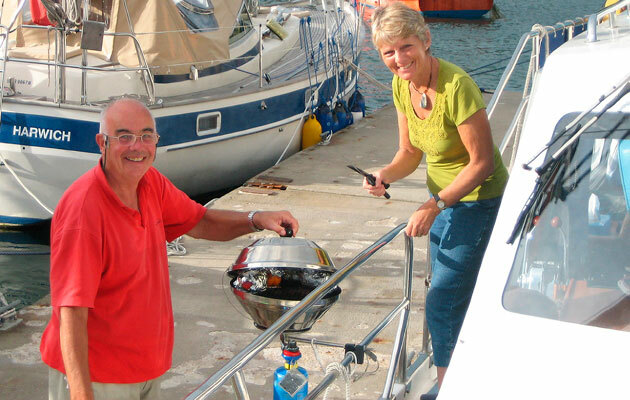 Now retired, Mick and Vi spend several months each summer just pottering in Brittany between St Malo and Lézardrieux – an idyllic style of cruising, I’d say.